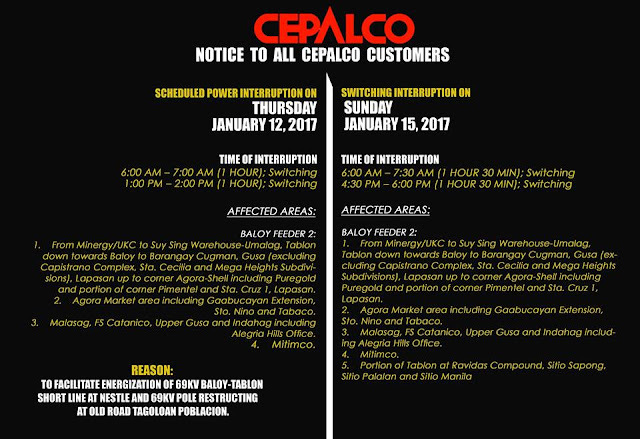 The Cagayan Electric Power & Light Co., Inc. (CEPALCO) would like to inform all customers of a SCHEDULED POWER INTERRUPTION on Thursday, January 12, 2017 and SWITCHING INTERRUPTION on Sunday, January 15, 2017 as shown below. TO FACILITATE ENERGIZATION OF 69KV BALOY-TABLON SHORT LINE AT NESTLE AND 69KV POLE RESTRUCTING AT OLD ROAD TAGOLOAN POBLACION. Portion of Tablon at Ravidas Compound, Sitio Sapong, Sitio Palalan and Sitio Manila. 1. From Minergy/UKC to Suy Sing Warehouse-Umalag, Tablon down towards Baloy to Barangay Cugman, Gusa (excluding Capistrano Complex, Sta. Cecilia and Mega Heights Subdivisions), Lapasan up to corner Agora-Shell including Puregold and portion of corner Pimentel and Sta. Cruz 1, Lapasan. 2. Agora Market area including Gaabucayan Extension, Sto. Nino and Tabaco. 3. Malasag, FS Catanico, Upper Gusa and Indahag including Alegria Hills Office. From Minergy/UKC to Suy Sing Warehouse-Umalag, Tablon down towards Baloy to Barangay Cugman, Gusa (excluding Capistrano Complex, Sta. Cecilia and Mega Heights Subdivisions), Lapasan up to corner Agora-Shell including Puregold and portion of corner Pimentel and Sta. Cruz 1, Lapasan. Agora Market area including Gaabucayan Extension, Sto. Nino and Tabaco. Malasag, FS Catanico, Upper Gusa and Indahag including Alegria Hills Office. 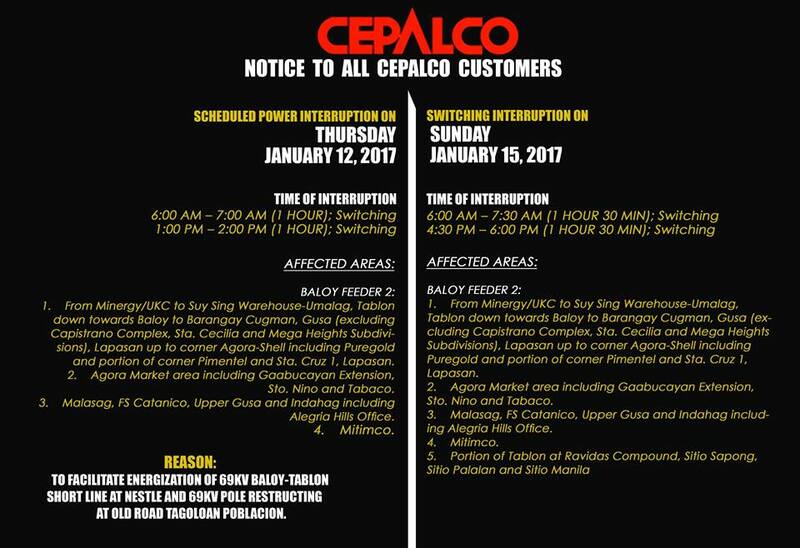 Power will however be restored immediately without further notice when Cepalco line and switching works are completed earlier than scheduled. 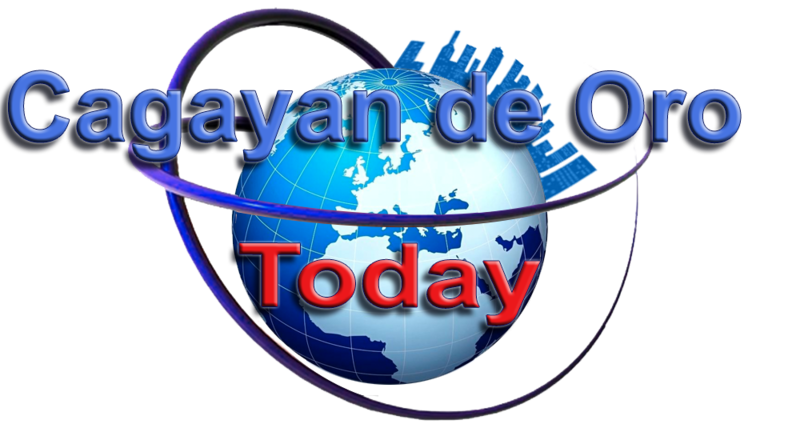 Head, Customer & Community Relations Dept.